Lunar New Year in Beijing: Dumplings, bad TV, a heady mix of alcohol and cheap explosives, and, of course, temple fairs. Depending on the last temple fair you visited, these annual events might seem like an excellent window into local custom where people from all walks of life gather like clouds to ring in the new Lunar year, or a dangerously overcrowded venue offering overpriced dribbly food, performances reliant more on volume than talent, and rows of rigged carnie games. But wherever you land on the temple fair divide, they are an indelible part of Beijing’s cultural history. Today’s New Year festivals are the last vestiges of an important system of markets and fairs which were a regular part of the city’s commercial and religious calendar. During the imperial era, markets rotated throughout the year among the city’s Daoist and Buddhist temples. Two important markets which date back to the 15th century were at Longfusi, near the Dongsi neighborhood, and Huguosi, on the other side of the city in the Xisi area. Longfusi held markets on the 9th and 10th of each month alternating with Huguosi, where the markets met on the 7th and 8th. Other temples throughout the city also held regular monthly markets and fairs. These were opportunities for residents to shop, meet friends for tea, or catch an opera. The festivals also provided a steady source of revenue for the temple, and there is evidence of competition between religious institutions over who could attract the most people to their periodic markets. The festival calendar reached its annual zenith during the Lunar New Year festival. One of the liveliest fairs each year took place in Changdian, an open area in Liulichang just to the southeast of Qianmen. Liulichang was long known for its shops of books, paintings, and antiques, and scholars knew that the Changdian Festival was a great time to buy that hard to locate Ming manuscript while also munching on candied haw berries (tang hulu). Changdian wasn’t the only fair to capitalize on a neighborhood’s reputation for a particular product. In the days leading up the lantern festival (held annually on the 15th day of the Lunar New Year), Beijingers would head over to the glittering stalls and shops of the appropriately named Dengshikou located outside the eastern gate of the Imperial City. There they would buy lanterns and supplies to decorate courtyards or just browse while strolling along the nearby lanes, marveling at the exquisite colorful lights on display. While many people came to the festivals to shop, others came to be entertained. 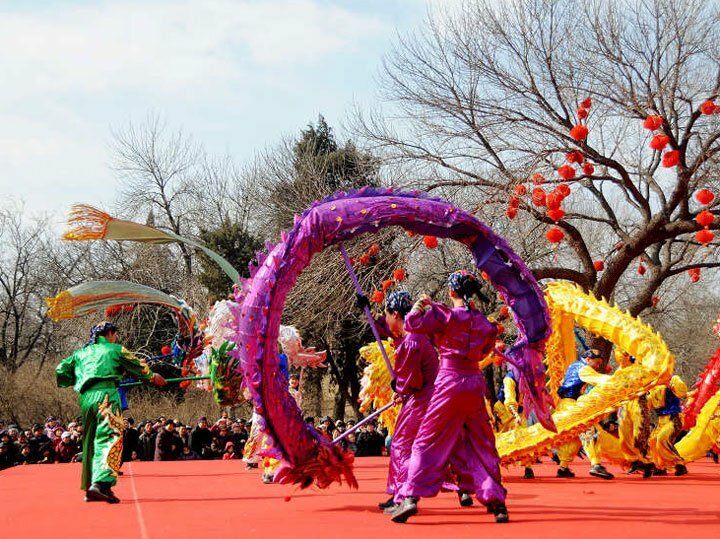 Regular performances during the Lunar New Year fairs included knife-throwers, acrobats jumping through flaming hoops, sword swallowing, and the juggling of sharp or highly flammable objects. Then, as now, Beijing’s residents never let a little thing like safety get in the way of a good time. Operas, plays, and other musical performances were always a highlight. Today, many consider attending indoor staged renditions of Peking Opera to be somewhat akin to listening to cats being waterboarded. But Peking Opera, like the bagpipes, was always meant to be more of an outdoor performance art. It was delivered on stages set above surging noisy crowds, more like what one would expect at Bonnaroo rather than the local opera house. The temple fairs also offered a range of services, some specific to welcoming in the new year. There were fortune tellers, itinerant dentists, pharmacists, professional letter writers, and seal carvers. The festivals were also a high point on the calendars for Beijing’s criminal classes. Gambling was a favorite activity for many attendees who might also take a moment to light incense in honor of a particularly lucky icon as added insurance for that afternoon’s games of chance. Praying for luck at the cricket fights wasn’t the only religious element to the fairs of course. In the days leading up to the celebration, temple clergy would wash images, perform sacrifices and carry out rituals to purify the space and to exorcise the temple of any unwanted spirits or hungry ghosts. In the 19th and 20th centuries, missionaries would sometimes try and infiltrate the fairs, setting up tents to preach the gospel to a crowd perhaps more interested in the spectacle of a foreigner giving a public lecture in pidgin Chinese than in converting to a new religion. Finally, the temple fairs performed an important role in integrating Beijing with the area around the capital. Just as the periodic markets brought together different neighborhoods for commerce and conversation each month, the temple fairs attracted merchants, performers and pilgrims from all over North China and beyond. This influx provided an annual boost to the city’s cosmopolitanism and urban culture. Some of the most famous markets and fairs from the imperial era no longer exist, but one example of a temple with a long history as a venue for monthly and annual festivals is the Dongyue Temple located on Chaoyangmen Wai. 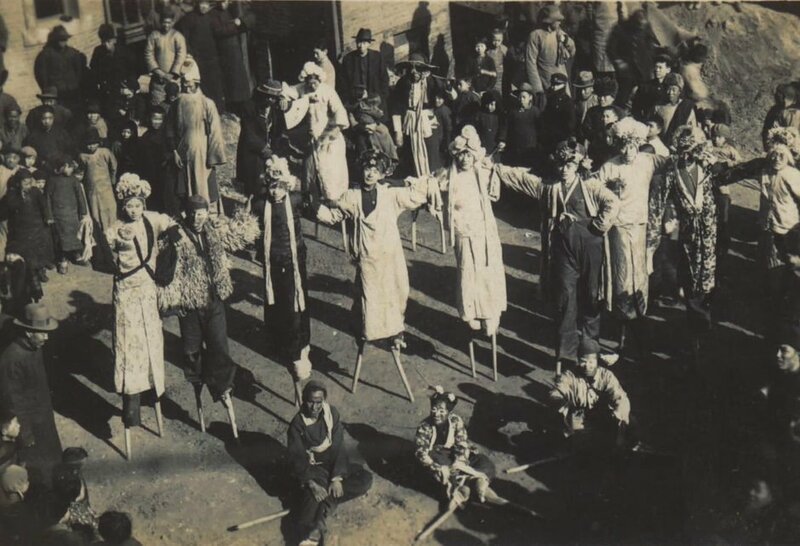 One foreign resident of Beijing in the early 20th century described the Lunar New Year festival as a riotous affair of heaving crowds. She observed elite women and men in their finest silks bowing respectfully at the various altars side-by-side with beggars and the indigent burning bundles of incense in a hope to attract the needed blessings of the God of Wealth. Today’s temple fairs are a link to this past. While they can be crowded and the goods, food, and entertainment on offer a bit different, attending a temple fair is one way today’s Beijingers, foreigners and Chinese alike, can take part in an activity which has echoed through our city for centuries. This article first appeared in the Jan/Feb 2017 issue of the Beijinger.